Need to free up your hands while communicating over your two-way radio? Your walkie-talkie set may include VOX technology for hands-free operation, but let’s face it—that is not a complete solution. A headset and earpiece allow you to speak and listen with your radio clipped securely to your belt. Need help finding the best headset and earpiece for your two-way radios? Check out the table below. Still need to know more about walkie talkie headsets and earpieces? Read on to learn all you need to know to make your purchase. What is a Headset and Earpiece? A headset and earpiece for two-way radio communication is designed to simplify your life. A cable connects the headset and earpiece to your two-way radio, allowing you to keep it clipped to your belt. If you do not have VOX, you do have to push the button to talk, but if you have VOX, operation is entirely hands-free. You do not need to hold the radio up to your mouth to speak. Thanks to the headset, your voice is transmitted clearly to the receiving party. Meanwhile, your earpiece allows you to hear the other party with the same sharp clarity. In short, a headset and earpiece do a great job canceling out noise and improving the quality and convenience of communication on a two-way radio set. Note that a headset and earpiece is not a set of two-way radios! You need to purchase the radios separately. These are accessories only. What devices will you use your headset and earpiece with? Make sure that the headset and earpiece can plug into the radio you plan to use. The features you need depend in part on how you are using your two-way radios. If you work in security for example, discreet design is important in a headset and earpiece. If you are playing airsoft, you need something you can wear under a full face mask. If you work in a busy, loud environment, you might need extra noise canceling, and so on. Make sure the connection type is right for your two-way radios and any other devices you plan to use with the headset and earpiece (MP3 players, etc.). 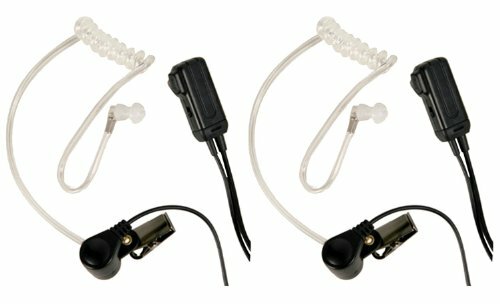 A transparent earpiece looks better in any setting, and may be important for reasons of discretion if you work on a security detachment. The more background noise your earpiece and headset can block out, the higher the quality will be for both your incoming and outgoing communications. You may be wearing your headset and earpiece all day long. For this reason comfort is a very important feature. The best earpieces are designed to be so unobtrusive that you can actually forget you are wearing them. 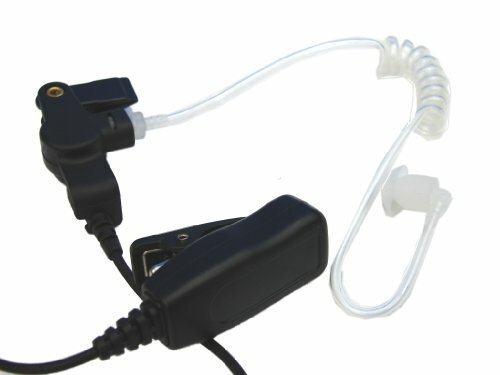 A lot of users have a hard time figuring out how to connect the earpiece and headset and get everything set up the first time. For this reason, you should shop for a set which is going to be easy to use and which includes a clear, helpful manual. Now you know more about what a headset and earpiece can do to simplify your life and bring clarity and comfort to your two-way radio communications. If you are ready to shop, scroll back up to the top of the page to check out our product comparison chart. There you can look at features and prices for top-selling, highly rated headset and earpiece sets on Amazon.com. 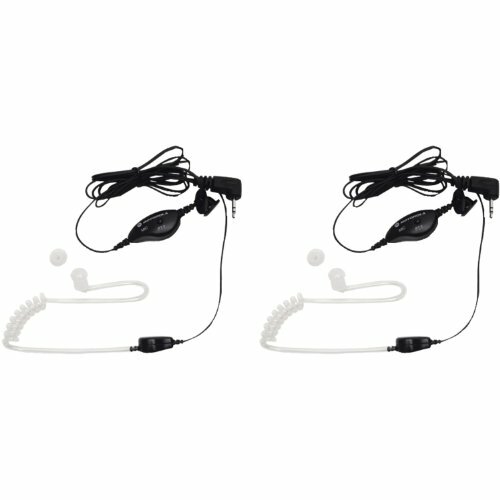 Now you have a pretty good idea for the kinds of products that are available if you are on the search for the perfect two-way headset + earpiece set. As you can see, there is a lot of variety when it comes to design. Always start by asking yourself what you need. A security guard doesn’t need the same headset as a hotel porter or a hiker. Once you take stock of your needs, you will be able to pick the right headset. The Midland AVPH3 excels when it comes to comfort. If you intend on using your headset for a long period of time, get an AVPH3. Your ears will thank you later. Extremely comfortable. This headset is so comfortable that you’ll forget you’re wearing it a few minutes after you put it on. Works just like a walkie talkie. The AVPH3 is so easy to use that even a small child could figure it out in less than 5 minutes. Nifty design. You’ll look like an FBI agent when you don your AVPH3. Compatible with S2 style 2-pin jacks. The AVPH3 is compatible with a huge array of walkie talkies and portable ham radios. Great for loud environments. Security professionals use AVPH3 to stay in touch when patrolling loud environments like bars and clubs. Awesome sound quality. Crystal clear sound is transmitted every time. Performs well on the paintball field. Your enemy will never hear you sneaking up on them because noise doesn’t leak out of the AVPH3. If you own a Kenwood product, you won’t be able to use the AVPH3. The AVPH3 isn’t compatible with K1 style 2-pin jacks. The clothing clip is made out of plastic. The clip would be sturdier if it were made out of metal. 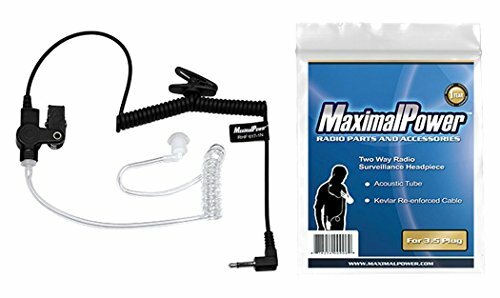 This headset from MaximalPower has recently made it to the bestsellers list on Amazon. Compared to the competition the RHF 617-1N headset is surprisingly inexpensive, yet it performs quite well. Reasonable price tag. 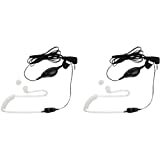 Most FBI-style security headsets cost at least twice as much as the RHF 617-1N. Speak and be heard in loud environments. Because this headset plugs right into your ear, you’ll be able to hear what’s going on in even the noisiest environments. Used by law enforcement. Many police officers are fans of the RHF 617-1N. Allows for private communication. In-ear headsets are more private than headsets that feature loudspeakers instead of earbuds. Eliminates feedback. You’ll never have to worry about distortion created by sound feedback loops if you switch to the RHF 617-1N. Standard 3.5mm jack. Unlike many headsets, you can use this one with any device that has a standard 3.5mm jack. Durable design. The RHF 617-1N’s polyurethane jacketed cord prevents interference and fraying. The black cord connected to the earpiece gets in the way. If it weren’t coiled, it would be easier to use. Voice audio comes through quite well on this device. However, music doesn’t sound very good. This inexpensive headset from Motorola is perfect for athlete. Though other headsets sound better, the Motorola 1518 is slim enough to fit under a helmet. Plus, it never gets knocked loose or come unplugged. Fits under a helmet. The earbud doesn’t stick out very far once you insert it into your ear, making it perfect for when you have to wear ear protection or a helmet. Crystal clear communication. Speech comes in loud and clear through the Motorola 1518. Good for snowboarding. When you have to wear mittens or gloves, this headset’s large PTT (Push To Talk) button comes in handy. Stays attached to your head. If you take a tumble while wearing th Motorola 1518, it’ll stay on your head. TalkAbout compatible. If you already own a Motorola TalkAbout, get this headset if you use it to communicate via a CIA-style earpiece. Super discreet. Nobody will hear your incoming transmissions but you if you have the Motorola 1518 plugged in. Durable clothing clip. The rugged clip is made out of high quality plastic that won’t easily chip or crack. This headset isn’t very loud. Low volume could be a problem if you intend to communicate in very loud environments. The Motorola 1518’s wire is short compared to most other headsets. It’s not a problem if you intend to carry your two way radio in your chest pocket, but the short cord could be awkward in some situations. In need of a two-wire surveillance mic which can be subjected to a lot of wear and tear and continue to perform? If you have a Motorola device, the Pulsat TW47 may offer you the features, durability and compatibility you need. Compatible with a number of Motorola devices. You can use this surveillance mice with any of the following Motorola models: CP200, CP200D XLS, PR400, EP450 GTX, GP300, P1225, CP185, P110 or SP50. Solid construction. You will be hard-pressed to find a surveillance mic with more rugged materials. The device is reinforced with Kevlar, so you know that it can stand up to heavy use. High-quality audio. Both output and reception are clear and relatively free of noise. Long life span. Because the Pulsat TW47 is so solidly manufactured, it should work for years if you take care of it. Fantastic value. You can spend a lot more on a surveillance mic, but it is hard to beat the Pulsat TW47 for great features and quality at a low price. Spend a little extra on Valley Enterprises ear molds, and you can use the device all day long in total comfort. In fact, you may almost forget it is there at times. Great warranty. A 12-month warranty backs up your purchase. Some models have shipped out which stop working within a week. This flaw only affects a few devices. Most work fine and continue to do so for a long time. I am a Head High School Football Coach. We purchased a nice set of headsets for our coaching staff last year. I want to purchase a set of earpiece type system for our Offensive Coordinator to be able to talk to our signalers on the sideline. *** Our Offensive Coordinator will be in the press box and 3-4 Managers will signal plays to the players on the field. The Offensive Coordinator in the press box will be telling them what to signal. We do not want to spend a lot be money is not a big issue. Could you help us out with this? The MaximalPower RHF 617-1N is a cost-effective option, and it can screen out background noise effectively, so maybe that would work for your needs. What microphone do you use with yours? We are agri-services and outdoor retail business. We are two months out from moving into our new 30,000 sq. ft. building where we are changing our name and expanding our inventory selection. Due to the size and scope, I am looking for lightweight headsets so we can communicate within the premises. I do not want type that has boom microphone that wraps into the front of the mouth (if that makes any sense) as I believe it would be intrusive between the customer and salesperson. What can you recommend? The MaximalPower RHF 617-1N seems to be popular for professional use. I’m not positive it is what you are looking for; I recommend taking a look at pictures to see if it will fit your needs. We recently purchased 8 Motorola Talkabout MS350 radios for use at our church by our security team. The radios sound great on their own, but as soon as we plug in the Motorola PTT headsets, everyone sounds like Charlie Brown’s teacher. We have tried a variety of settings but still get the same results. We don’t mind buying different headsets if they will work better, but cannot afford to spend money on something that won’t work any better. Suggestions? The Motorola 1518 Surveillance Headset would probably be compatible with your radios (double check that though). Reviews are mixed–some users seem to love this product, while others say the sound quality could be better. It’s one option to consider. If I run across something which I think may work better, I will be sure to let you know. I have 4 midland gxt860’s we use for trail riding. Would I be able to use a helmet mounted headset, that plugs into the 860, with the VOX feature on these units? It would make our riding safer if we didnt have to stop, PTT. You could consider either Midland AVPH2 or Midland AVPH3. Both of them feature PTT and VOX. With Midland AVPH2, a couple of reviewers mentioned the VOX, but they weren’t impressed with the quality. For that reason, I would advise the Midland AVPH3 instead. You can wear it inside your helmet, and the reviews indicate that both the PTT and VOX work well. I recommend that you check out our Business Two-Way Radio Guide. Many two-way radios built specifically for business have features you won’t find in models for personal use. Quite a few of the models featured there have PTT and hands-free operation available, and all are designed to facilitate workplace communication. Great article. The Midland AVPH3 are the best headset. I personally used them and I really like their audio quality. Thanks for the post.